This free long cape pattern is easy to make. There are no sew and easy options to make this cape. This cape also can be wrapped and worn in different ways to achieve different looks. Wrap a belt around it to form sleeves, wear it loose and flowing, or tie the front behind your back for a unique look. 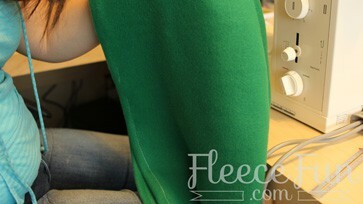 You can make it without the hood with out sewing anything! 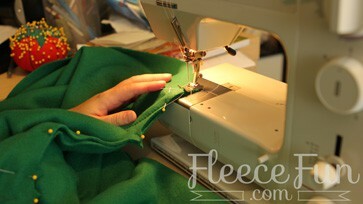 Adding the hood is quick and an easy sew. 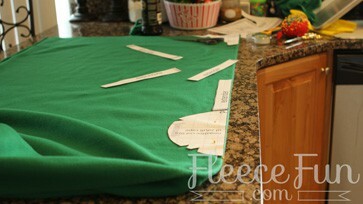 2 – 2.5 yards fleece for a long cape, less if you desire a shorter cape. Secret Tip: The hoods on the Red Riding Hood Cape, the fast hooded cape,the easy long cape and the long hooded cape are all interchangeable – so if like a hood more from another cape you can mix and match to get the look you want. Video tutorial here, written below. Cut out two pieces of the hood. Set aside. 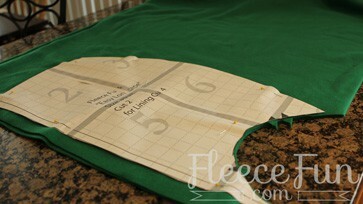 Make sure remaining cloth has straight ends on each side. 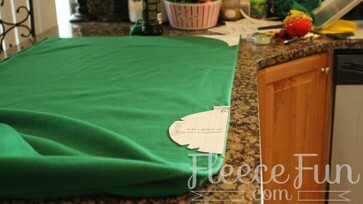 Easy Sew and No Sew: The length and width of the cape is up to you. 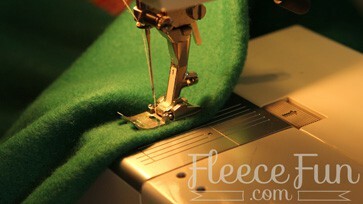 In the pattern example I used 2 yards of fleece and the full width so it was 6 feet long and 60 inches wide. The width is food for a man, but it might be too bulky for a female. For a woman I recommend cutting the width down to 50 inches ( you can make some cute scarves with left over fabric). Once you have the width and length that you want it’s time to start cutting out the cape. 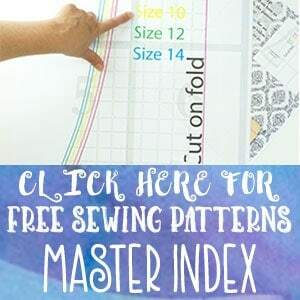 Find the the middle point of your fabric length and mark it with a pin ( so if you fabric is 2 yards long mark it at 1 yard). This will be the starting point of where we will build the pattern. 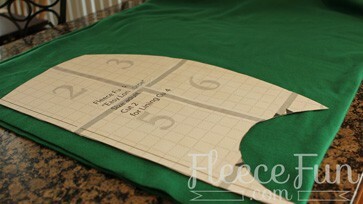 Carefully cut out the pattern piece – you just made the neck and front of your cape! 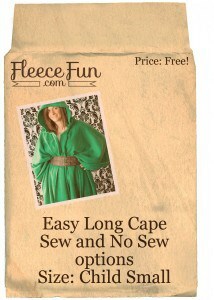 We just made the front, but now let’s give the cape a little nicer look on the ends. 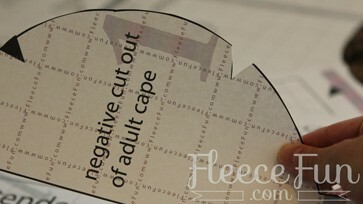 Take the other curved negative cut out (the one that has two pointy ends – the wrong one is shown in the picture). 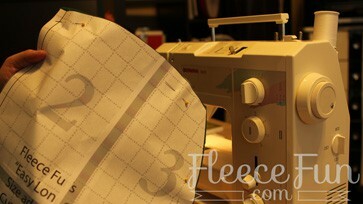 On the end where you just did the negative cut out, take it to the edge (opposite from the fold) and cut so it’s curved. then go to the opposite end of the cloth (the side that you didn’t cut out the neck hole) and place on the edge of the fabric opposite of the fold. Cut a curve. 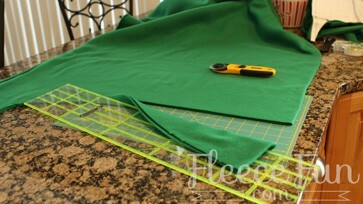 If you are doing the no sew version of the cape your finished! If you are making the sew version there are a couple more steps. 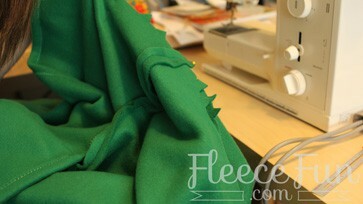 Take the two hood pieces and using a .5 inch seam allowance sew them together. 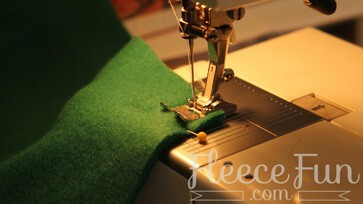 Then turn under rim of hoo .5 and using a zig sag stitch along the edge sew down. With right sides together, Line up the triangles with each other from the hood and the cape. Pin. Sew together using a .5 inch seam allowance. Trim threads and you’re finished! Thanks for a great pattern, just in time for cold weather. Just finished assembling the pattern! Could I use this to make a hip-long, wool-blend cape? Maybe even line it with something like a thin cotton fabric or polyester? Sarah, as long as you finish the edges or line the cape it should work fine. Keep in mind that the tutorial assumes you are using a fabric that won’t unravel so you will have take additional steps to turn under edges. line or serge the edges. Thank so much for the pattern. I haven’t sewn in almost 10 years and just finished one of these capes with a lining for my daughter’s costume…one more to go for my second daughter. And I also adapted the idea to make a ghost costume for my son (no opening in the front and an extra large hood). Thank you for making it easy to start sewing! could you specify the remainder of what? exactly? Want to help you! About how long is the finished cape from shoulders to the bottom? As long you desire to make it – this pattern is flexible you determine the length yourself. There are a lot of questions there! Silk will work if you finish the edges. This pattern is designed to fit on material that is 60 inches in width – so be mindful of that. HOWEVER I don’t know the width of the material, your height etc. You’ll need to figure out your own yardage. People have extended the cape – but I don’t offer this option as it does take some effort and pattern design knowledge as this is a circular cape, which allows it to lay nicely. My free patterns are offered “as is”. The red hood’s base is larger than the green’s. However I think you might be able to make it work – You’ll just need to gather the base of the red hood a little to make it fit. 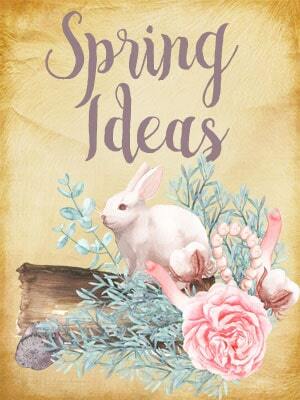 This really is a super quick and easy project, just as you prmised!! Thanks for the video, you made every step very clear and easy to understand. And getting the FREE pattern…..wow!! what a deal. Thanks again for this easy* friendly* fun project. I’ll be visiting often to see what’s new. Have made the Little Red Riding Hood cape for my grand daughter for Halloween! It came out really good and all I have to do is add the ribbon! I lined the hood and the front and bottom with about 6 inches of red flannel with wolves on it! I’m trying to make a cape for my cousin! I’ve alreasdy bought his favorite team fleece! He is wheelchair bound from a swimming accident last summer! Do you think I can use this cape pattern for him! I have been looking for a cape pattern for the handicap and have not found one yet! Would you make it that he can sit on it or make it short in the back? Everyone wants to sell you a cape already made! I fell in love with this as soon as I saw it and have just made one for my daughter however I do not understand why the cut out for the neck is not central on the pattern. I followed the pattern (I think!) and the cape is lopsided with more material on one side than the other and it looks bad:( any help? oh no! That’s not good! I most definitely didn’t design it to be lopsided. Could you email me a picture to see if I can figure out what went wrong? I just wanted to say thank you for the great pattern! I just made this yesterday, definitely easy enough for a raw beginner 🙂 I used fleece as a liner, and flannel for an outer layer, and it’s so cozy! My husband will love it. For the record, mine was not lopsided, sorry Claire, I think you may have done something wrong. Thankyou so much for this pattern! I know it’s kinda late to say this, but it was the main part of my Halloween costume (and all future Harry Potter cosplays). Now even my friends are asking for their own! Thanks! Thank you for the pattern! How hard would it be to make sleeves on this? I am hoping to use this for a fairy god mother costume to complement my daughter as Cinderella. Any tips? 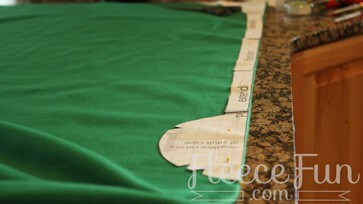 What I would do is just sew two seams, on on each side from the out side edge to about half way in to make sleeves. Thank you so much for this pattern! I adapted it a little to make a warm, fleece-lined Dragonrider-styled cape with a nice leather closure and imitation leather “dragonscales” all down the back and shoulders! My girlfriend loves it! My very first sewing project ever with my 1972 Sears-Kenmore 148.12170, and it went great thanks to you!